Welcome back to the site that aims to please the bookish part of you every day of the week...Satisfaction for Insatiable Readers. 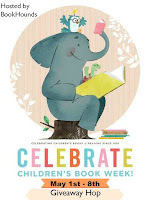 Despite yesterday's break (hey, a girl needs one now and again especially with the Dell H*ll I was going through - for those that follow on Twitter and Facebook, my apologies for the rant - but I digress), we're still celebrating Children's Book Week like it'll never end. What does that mean for you? Well, let's see...you still have a chance to win an AMAZING prize pack starring NINE titles by none other than Children's Fiction author Ursula Vernon ... just CLICK HERE to get your entries in ... and it just so happens that today's post ties in with that very giveaway. How so? The obvious reasons of course, being that it centers on Children's Fiction, but the less obvious one is what makes our red carpet roll out today so spectacular. Along with the opportunity to bring this FAB giveaway to all of you, I had the chance to do what most bloggers dream of doing...interviewing an author! In this case, the very mind behind the works I'm giving away (courtesy of Penguin Young Readers!)! That's right! Prepare to be dazzled. Prepare to be amazed. Prepare to step inside the whit and worlds of none other than Ursula Vernon! Tell me, what inspired you to become a writer? What was that AH-HA moment that convinced you THIS was the path for you? That’s a great question, and I wish I had a great answer! But I actually always wanted to be a writer. I don’t remember having an ah-ha moment so much as reading books, even when very young, and immediately thinking “I want more like this! I will write more!” I was hammering out Watership Down fan fiction when I was seven years old, which may tell you something. Though you write Children's Fiction, there is quite a good bit of wit, humor, and snark for older readers to enjoy as well. Tell us, how do you determine the "voice" your stories will have? Is it purely about the audience, or are you writing the stories that you would want to read? Heh! I wish I could determine a ‘voice’ for my stories—I actually just started writing and my editors told me that it was middle-grade! I only seem to have one voice, when you get right down to it. (This occasionally leads to problems when I want to write for adults…) I figure that since I enjoy children’s books, lots of adult readers probably do too, and I like to include a few things for them as well as the kids. I have to say, I enjoyed the Dragonbreath series dearly, but Princess Hamster is a hoot! Of all the works you've created thus far, which was has been your favorite and why? I really enjoy Hamster Princess, but also Castle Hangnail. It’s hard to choose! The humor in Hamster Princess kept me laughing while I was writing it (which is either a good sign or a terrible one!) But I loved be able to expand the world out in Castle Hangnail and include things like Wormrise and minor characters like the bats and moles. 4.) Now that we've established that, how about another FAVORITE question? Of the characters throughout your works, which do YOU identify with the most and why? Now for a few DEEPER questions. Just say (umm, type) the first thing that comes to mind. ...thing about writing? Frequent naps! Ursula Vernon is the author and illustrator of "Nurk," "Digger," and a number of other projects. The daughter of an artist, she spent her youth attempting to rebel and become a scientist, but eventually succumbed to the siren song of paint (although not before getting a degree in anthropology, because life isn't complete without student loans, right?). Her work has been nominated for an Eisner award, "Talent Deserving of Wider Recognition" and a number of Webcomics Choice Awards. Ursula grew up in Oregon and Arizona, went to college at Macalester College in Minnesota, and stayed there for ten years, until she finally learned to drive in deep snow and was obligated to leave the state. In addition to writing and making art, Ms. Vernon is "an avid birdwatcher, occasional neophyte practitioner of the sword art of iaido, and an amateur thrower of pots." She is active in her local webcomics community, and can occasionally be found at local science fiction conventions, looking vaguely baffled by the crowd and signing anything put in front of her. Having moved across the country several times, she eventually settled in Pittsboro, North Carolina, where she works full-time as an artist and creator of oddities. She lives with her boyfriend, a spastic Beagle, a (fairly) mellow Border Collie, a small collection of cats, and a large collection of Indonesian demon masks, which generally manage to keep her out of trouble. Special thanks to Rachel at Penguin Young Readers for the chance to shine the spotlight on this author's works as well as ask those burning questions racing through my mind. My thanks as well to author Ursula Vernon for humoring my infiltration into her writing world and sharing a bit of herself with all of us. (THANKS!) For more information on the author, her growing body of works, or the publisher, feel free to click through the links provided above. YOUR CHANCE TO WIN THE TITLES BELOW IN THE CHILDREN'S BOOK WEEK GIVEAWAY HOP ENDS 05/08/16! It's nice to meet Ursula and learn about her fun books! They look delightful. MG is my favourite age group to read and write, too. Love this interview! I love the smell of rain too, especially when it's on a wheat field. That's very specific, I know. But I did grow up in the country. Thanks for sharing this interview. It was fun to find out more about Ursula and her books. My kids love these books but I haven't been able to read one yet (I can't get them away from the kiddos long enough).